It's hard to believe Halloween is right around the corner. We make a big deal out of this holiday in our home. We love baking, cooking and creating Halloween crafts during the month of October to celebrate Halloween. One of my favorite treats to make for the kids are Mummy Dogs and Monster Munch. Both are simple to make and I love that the kids can help make these spooky treats. One of my favorite thing to do in the Fall is to bake, so to get inspiration I love to sit down and watch The Food Network to see what cool creations the chefs come up with. Not only do I love watching the channel for inspiration on ideas to make in my own home, I also love watching their cooking and bake off competition shows and I'm super excited for their Halloween Baking Championship. The four episode, one hour show will be hosted by Richard Blais and the judges are the ever so lovely, Carla Hall, Sherry Yard and Ron Ben-Israel. 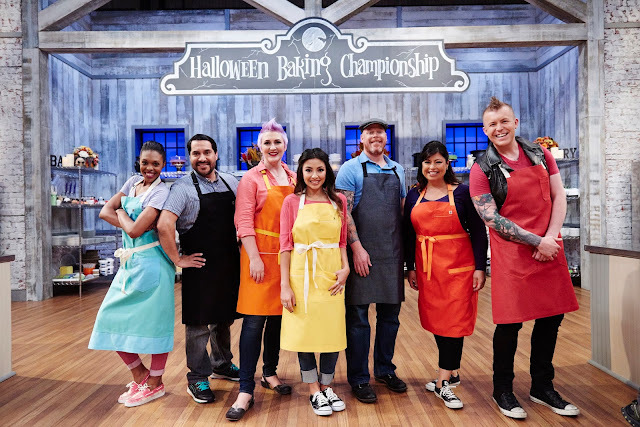 The contestants will have a chance to prove their spooky, creative baking abilities in order to wow the judges in order to win the title, Halloween Baking Champion and a grand prize of $25,000. Mark your calendars as The Halloween Baking Championship airs, Monday, October 5th at 9:00pm. Get ready to watch the competitors as their baking skills are put to the test in difficult challenges that will cause quite a fright! Which ghostly treat will be sent to the baker’s graveyard and never return?